Its simple to add veggies to your breakfast, but most dont consider the ease and comfort of a salad. 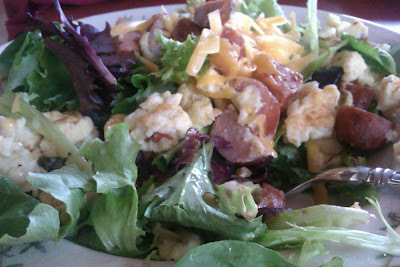 Instead of a boring bowl of scrambled eggs, try them with chicken sausage and poppyseed dressing over spring greens! Add a sprinkling of cheddar, and you wont believe you've never thought of and egg salad like this before! Simple Chores . . . Saw this on Pinterest, and had a 'duh' moment! What a great idea for when my little princess breaks the rules or wants a new toy . . . Simple Ricotta Meatballs . . . 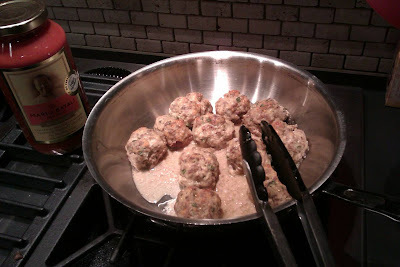 So, I love a good, juicy, oven-baked meatball as much as the next Italian (even if I'm Swiss). This is a simple recipe I love, and they are so juicy! Mix in a giant bowl, I use a pot, even. Roll into balls a little bigger than golfballs. Line up in a pan with sides as the fat will pool during cooking. Bake 375 for 35-40 min. Remove and add to your favorite noodles and sauce, freeze rest! Borrowed this from Bloghungry.typepad.com . . . so easy! Simple Scarf Necklace . . . This is a necklace I've seen from Anthropologie, but how easy would it be to make! It'd be fun to collect the ribbons and choose your own pattern, color, theme . . . Simply Fluffy Tulle Flowers . . . Saw this floating around Pinterest and loved it! So cheap, too. Sometimes I can find tulle for $0.50 a yard. Well, here it is - a tutorial on how to make a tissue paper flower (with tulle). Good luck and please feel free to ask any questions in the comments section if anything is unclear. First of all, assemble your stuff - tissue paper (2 colours if desired), tulle, string and scissors. Cut two rectangles of each colour and two rectangles of tulle. The flower I have made used 38cm x 25.5cm sheets but it doesn't really matter, just so long as the pieces are all rectangular and of the same size. Lay the six sheets on top of each other. If you are using colours, I tend to put the darker sheets on the bottom, lighter ones in the middle and tulle on top however, living in the creative world we do, don't let me stifle you. Line up their edges and begin to fold them back and forth in a concertina. My folds were about three centimetres wide but once again, don't let me rain on your parade. Snip the ends with scissors to make a petal shape. Fan out one side into a half circle. Then, delicately begin separating the layers, taking care not to ruin the pleats or tear the tissue paper (when this happens, don't cry... I sort of just shove it back in and hope no one notices). Lifting and zshoozshing (an extremely technical term that may or may not have or have originated in 23BC China... or maybe just two minutes ago). Unfurl the other side and continue in the same way, separating, lifting and zshoozshing. Finally, use your hands to gently scrunch (I am now just thinking what... use your hands as opposed to your mouth... as though you need advice to prevent you from making your tissue paper soggy and unusable) and zshoozsh to manipulate it into a pleasingly floral shape (but once again, don't let my need for a chaotic symmetry suppress your inner urges - if you want it to sprout in one particular direction, don't let me tell you it is not regular enough). And then you are done!!! Now you can go crazy with any colour you like. The above two have eight layers of tissue rather than six... there are all sorts of crazy ways you can go so get folding and have fun. p.s. Can you tell that I have been at home with two little boys today, none of us very well. Maybe I have been just a little too excited communicating to the outside world, but you know, some days are long and the good bits have to be savoured (the writing and taking photos bit... not the explaining why you can only have antibiotics when it is prescribed to you and it is not favouritism that Archie (bronchitis) gets to have pink liquid and the other one (sore throat) gets to have none. It really doesn't smell very nice anyway. Simply True . . .